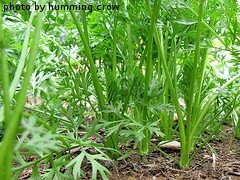 Need Information About Growing Carrots? We have lots of answers to your questions about growing carrots. They are simple to plant, easy to fertilize and fun to harvest. They don't take up much space in the garden. Carrots can be eaten raw or steamed, sauteed, roasted or used in breads and cake. They can also be juiced and mixed with a wide variety of fruit purees for a healthy smoothie. Carrots are a cool season crop that thrive when soil temperatures are about 65 degrees F. They tolerate frost very well, but require lots of sun and should be planted in well tilled soil. Most carrot varieties are ready for harvest 60-75 days after planting. Because of their short growing season and tolerance of cool weather, some folks plant two carrot crops each year - one in the spring and another in the fall. Carrots are well suited for both traditional and container gardens. They are a great way to introduce children to vegetable gardening. Because they are root vegetables, it's important that the soil is tilled deep when growing carrots. It's usually a good idea to till a couple of inches deeper than the carrots are expected to grow. It's also important that the soil be loose and airy. 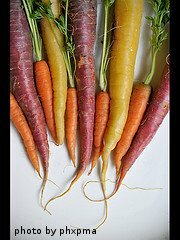 Carrots are more difficult to grow in dense, compact soil. Lots of carrot varieties are available to the backyard vegetable gardener. Some folks are surprised to learn that carrots come in different shapes, colors and textures. Some varieties have a higher sugar content than others. Some carrots are round while others are long and slender. Carrots are a great source of beta carotene, which the human body converts to vitamin A. They are also a good source of vitamins B, C, D, E and K. Some studies suggest that eating carrots regularly may help lower cholesterol. www.Getting-Started-With-Healthy-Eating.com , a site that shares ideas for changing your life with healthy eating. After harvest, extra carrots can be easily canned, frozen or dried. They will also stay fresh in your refrigerator for up to 8 weeks. 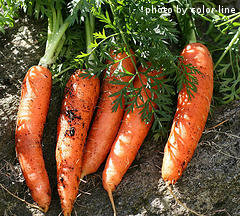 Click on the following links to learn more about growing carrots.